The sun is out and it feels like we are well and truly into summer! For the next Scottish Friendly Children’s Book tour, the Scottish Book Trust Schools Team is heading to new territory south of the border. 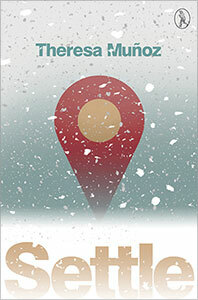 We will be visiting a number of schools across sunny Teesside with the exciting up-and-coming poet Theresa Muñoz. Her first poetry collection Settle explores contemporary issues including migration and technology, and is sure to spark discussion amongst the school pupils we visit! To celebrate Theresa’s tour, we are giving away a free signed copy of her poetry collection Settle. The collection is entertaining but thoughtful, and chimes with current discussions around modern technology and migration. To be in with a chance of winning a free copy of Settle, simply answer this question. How many syllables does a Haiku have in each line? The closing date is Wednesday 5th July at 12pm. To enter please add your answer as a comment below along with your name, who you would like the book to be dedicated to and email address. View full terms and conditions here.